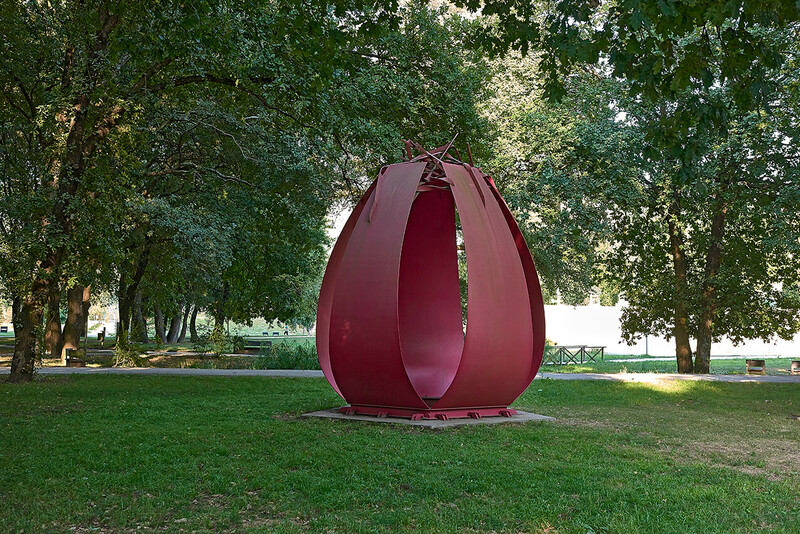 Just as birds carefully build their nests to hatch their eggs and raise their young till they can fly on their own, Kishida built his egg in that big nest of Rabada park in Santo Tirso. Oeuf du vent [Wind egg] was born from a sensorial experience of space: the leaves rustling in an invisible wind and the silhouettes made by the air moving among the trees. It was the invisible immateriality of the environment that essentially triggered Kishida’s inspiration and his wish to turn it into matter. Kishida Katsuji’s coherent, rigorous oeuvre has been focused on non figurative sculpture, whether monumental or unimposing. Made of painted and unpainted metals, especially steel, Kishida’s sculptures are based on loosely interpreted geometric (usually ovoid) shapes, and built through intricately articulated surfaces creating volume. This articulation device conceived by the artist gives his pieces a light, airy appearance, revealing his permanent concern with the inside/outside dichotomy. If at all painted, his sculptures are mostly red, a colour he associates with earth, rust and therefore the passage of time.